It’s been a huge year for Auckland based artist & illustrator Greg Straight. He first became known as an artist about three years ago when after working for many years as a graphic designer, he decided to turn his focus back to his fine arts background and produced a striking range of kiwiana art prints inspired by the Tiki. This sought after collection that is available in galleries nationwide is characterised by the bright hues and strong graphic edge that are typical of the signature style for which Greg has become known. His illustrative skills have also led to a stream of commissions from high profile clients such as Wespac, NZ Tourism, The Edge, 2Degrees, Les Mils, Whitcoulls and more recently Remix, Matua Wine and Chelsea Sugar. As quoted by Tina Moore from Remix, “I’ve seen your work everywhere lately”. In fact, it’s likely that even if you haven’t realised it at the time, you have at some point in the last year or two been staring at a piece of Greg Straight art. Either on the back of a bus, on the magazine shelves, in the bank, on a billboard on the supermarket shelves or on one of the many products he has embellished with his bold designs of late. Even if you did miss all that you won’t look past the collector’s edition tin he recently did for iconic kiwi brand Chelsea for their Golden Syrup. NZ Sugar senior manager Tracey McKay says she is delighted with the eye-catching finished result. “Greg’s artwork flawlessly encapsulates the New Zealand culture, which is at the heart of the Chelsea brand. We are proud to partner with such a progressive artist who truly understands our vision and values, and who has managed to translate this into an exquisite piece of art," she says. 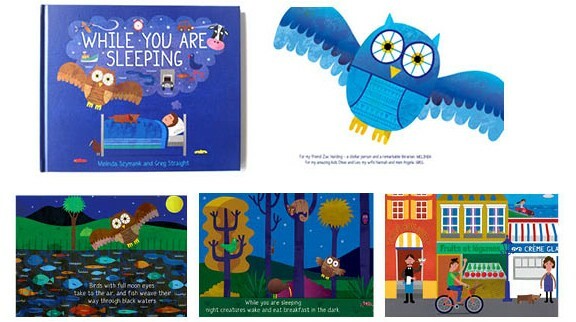 Greg’s versatility as an artist is well demonstrated by his ability to produce high quality detailed artwork such as this tin alongside designs targeted for a younger audience, such as Whitcoulls stationary and the illustrations for his first children’s book ‘While You Are Sleeping’ by Melinda Szymanik for which he is receiving rave reviews. 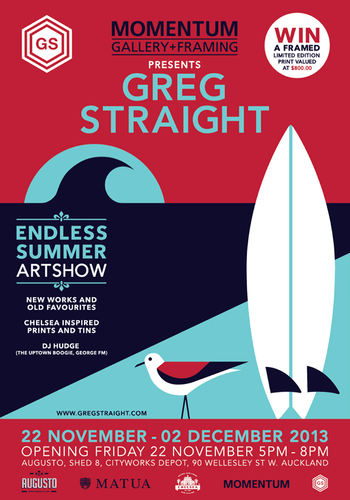 To celebrate such a huge year, Greg felt it was the right time for an art show where he will be showcasing old favourites and new works including a range based on his artwork for Chelsea. Greg has always believed in making art affordable for everyone, which is why he will be making a wide range of prints available on the opening night and during the following week. Prices will start from just $89.00 for an A3 open edition print. Start your Greg Straight collection at this much anticipated, end of year celebration!